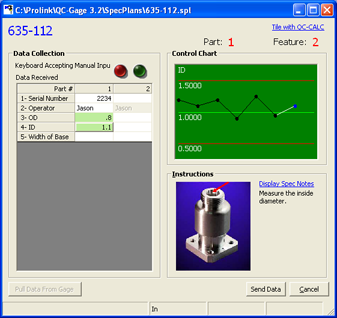 Product Spotlight: QC-Gage 3.2 Released!! NEW Horizontal and Vertical Views - The run screen can be viewed either horizontally or vertically based on your data collection needs. NEW Calculated Dimensions - You can create calculated dimensions within QC-Gage that use shared lookup tables to calculate their values before sending to QC-CALC. This can help with thermal compensation. Greater Spec Plan organization - You can group your spec plans on separate tabs on the main screen or optionally use the new Explorer view if you have a lot of plans grouped in separate folders. NEW QC-CALC Lookback functionality - This allows you to pull back the last 100 points that have already been committed to QC-CALC while you are measuring, giving you better data visibility. NEW Save/Continue functionality - You can stop your measuring routine and resume it later to combine measurements from before and after a particular time intensive operation on your part. IMPROVED Factors - All factor options are now at the individual factor level allowing greater flexibility with your factors. Download QC-Gage 3.2 from our website and give it a try today! Tip: Run Excel Reports in the Buddy direct from QC-CALC! As we're sure you've heard by now, the SPC Office Buddy is extremely useful for creating any custom Excel report you can dream up. Up until now, the only thing that has been lacking is the ability to run the Excel Jobs in the Buddy automatically. So we went ahead and added it. Now you can set up QC-CALC to automatically export to the SPC Office Buddy and run the Excel Job of your choice. The filtered data in QC-CALC will automatically be sent and the Buddy will be instructed to launch the Excel Job of your choice. This makes it extremely easy to create your Excel reports from within QC-CALC. In QC-CALC Real-Time, choose Export > Export Data. 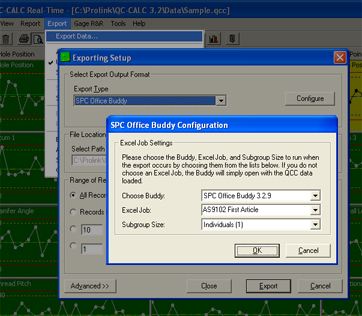 Choose SPC Office Buddy as the Export Type. Choose the Excel Job to run and the Subgroup Size to use from the lists. Once you click the Export button, you will immediately see the Buddy launch and the Excel Job you specified will run using the data you specified in QC-CALC. If you have filters applied in QC-CALC, they will be observed. You can set this up for Automatic Exporting in the same manner either globally or at the part level. If you have an earlier version of QC-CALC, then it's a great time to upgrade and take advantage of all the new features in QC-CALC 3.2. You can download version 3.2 and install it into a different folder to try it out before upgrading since multiple versions can coexist.